Instead of producing fish, it is now the breeding ground for mosquitoes. The air around the river is so noxious that people walking by it have to hold their noses. Rahom Ali was born and brought up near the river. When he was a teenager, he used to bathe in the river everyday. He would often stand and watch the large sailboats sailing gracefully in the once huge river; it was a common sight all throughout the year. Now in his 70s Rathom Ali has seen a drastic change in the huge river of his childhood along with it a change in the livelihood of the people. The river has shrunk to a fraction of what it was before. It is also a river on its deathbed. Starting from Musakha river in Rajshahi, the Narod river has crossed the Natore town before falling into another river in Pabna. Narod is one of numerous rivers that are already dead or dying due to lack of flow and dredging, dumping of wastes and unabated encroachment. Once a source of abundant fish and water for irrigation, the river now has nothing to offer to the 1.5 million residents of Natore besides an unhealthy environment created by the constant dumping of chemical and household wastes. Instead of producing fish, it is now the breeding ground for mosquitoes. The air around the river is so noxious that people walking by it have to hold their noses. With the running out of water in the river, the people who used to earn their livelihood by catching fish and rowing boats became jobless. They were forced to change the livelihoods they had clutched onto for generations. Farmers are, however, the worst victims. When water was available, they could easily irrigate their paddy fields. Now they have to put in a lot more physical effort and money for it. “Narod was the lifeline of Natore,” says Rahom, a farmer of Tebaria area located in the southern part of the river. He remembers the exciting boat races arranged every year during the rainy season. “It was the most attractive event of that time. Fifteen to 20 teams used to take part in the competition and winning the race was prestigious. People from distant villages used to gather in Natore town to enjoy the competition,” adds Rahom, now a father of three sons and two daughters. Rahom says he and his elder brother Dulal Bepari were lucky enough to be members of a team and took part in that competition. He could not remember when the last competition was arranged. Unabated grabbing of river land and the absence of dredging have turned it into a narrow canal. Then the river was wide enough and there was always a steady flow of water throughout the year. In the rainy season, the river the current would become strong and the waves would turn almost violent. Unabated grabbing of river land and the absence of dredging has left it into a narrow canal. Once the lifeline of the village it is now a reminder of crruption. He saw how a mighty river turned to a narrow polluted canal in a span of two to three decades. Indicating the width of the river, he says the road along the river and structures on the banks have been constructed occupying river land. He fears the river may vanish altogether in the near future if this kind of encroachment continues. “You can no longer call it a river. 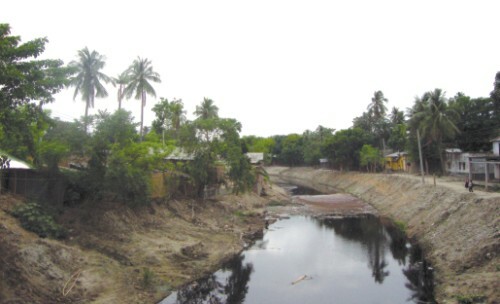 It's just a canal being used for dumping wastes of the town,” regretted Khalid, who is also the general secretary of Narod River Protection Committee. The committee has been formed comprising a group of conscious people of the town. It is arranging various programmes to draw the attention of the local administration and save the river from grabbing and pollution. However, neither the local administration nor the government has paid heed to the campaign. On a recent visit to Natore, one could see numerous houses and shops encroaching on the river stretching on both sides at Godagari, Malihati, Kandivita, Mirpara, Kanaikhali and Patuapara points. Natore Sugar Mills, Jamuna Distillery and Pran Agro Limited, established close to the riverbank, are constantly discarding their toxic chemicals into it. “The river Narod has now become the sorrow of the people as it is causing various problems, environmental pollution and health hazards,” said Khalid. He says he heard from his predecessors that large boats used to come to Natore from Dhaka and Murshidabad. “I also heard of catching Hilsha fish in the river,” he says, adding everyone, including politicians, teachers and journalists must take the responsibility of their failure in saving the river. The 36-kilometre river is fast losing its land to the illegal but influential grabbers in the district. Sensing it, the government in 2008 took a project to revive Narod by re-excavating it. But the Tk 13 crore project is quickly proving futile as the river is being narrowed down further due to dumping of earth on both the banks by lifting earth from the middle. Residents of Natore town allege the project will hardly bring any benefits for them saying it will only allow the politically influential to make money and the grabbers to further occupy the filled banks of the river. They expressed deep frustration over the way the project is being implemented. They say the authorities should have demarcated the river first and removed the illegal structures before implementing the project. “All, including the grabbers will be benefited if the river restored to its previous state,” believes Dilip Bhadra, a Professor of Economics of Nawab Sirajuddoula Government College in Natore. He says the river cannot be saved until and unless the local politicians come forward and take the responsibility, considering the multiple benefits of a river and the interests of the people. “It is devastating for us that the river is losing its width in the name of digging. 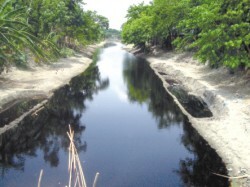 The project is turning the canal-like river into a drain as grabbers are again active to occupy more river land,” laments Yunus Ali, a resident of Jongli area of Natore town. Like Yunus, many living on either side of the river strongly protest filling the river banks and demanded putting the earth somewhere else to save the river. They said the earth would come down to the river reducing its depth once there is a downpour. Nurul Islam Nuru, a resident of Natore town, terms the work as eyewash. “How can the government allow the irregularities that are taking place in broad daylight?” he questions. Executive engineer of Water Development Board (WDB) in Natore, Musa Nurur Rahman has no rebuttle for the allegations. He claims the earth left on the banks would be shifted later, but locals term it a total farce as the earth would soon come down to the river further reducing its depth whenever there is heavy downpour. The demand of Natore residents to revive the river by digging it properly and ousting the grabbers is fast losing momentum. Their hope to see Narod river flow again with some of its past vigour will be dashed with the failure of the project.